PULLMAN, Wash. (AP) — The University of Washington marching band did not perform during the school’s annual rivalry game against Washington State University on Friday, after one of its three charter buses rolled onto its side while traveling from Seattle to eastern Washington for the game. The Washington State band performed the Washington fight song “Bow Down to Washington” during a pregame performance on the field. 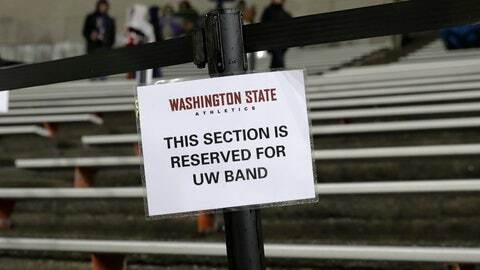 The section of Martin Stadium where the Washington band would have sat was roped off and left empty.